Amazingly, because of how the Confidence system of Trivia Club's Oscar pool works, only an unlucky few who put big points behind the seemingly inevitable crowning of La La Land ultimately affected. By then the top two finishers had built up enough momentum and didn't lose much, while the next two in the standings had not put enough confidence behind the feel good victory for the first all-Black AND LGBTQ Best Picture winner! The biggest winner, thanks to Moonlight? The fifth spot in our Top Five! Just as a reminder as to how our Oscar Confidence Pool works! 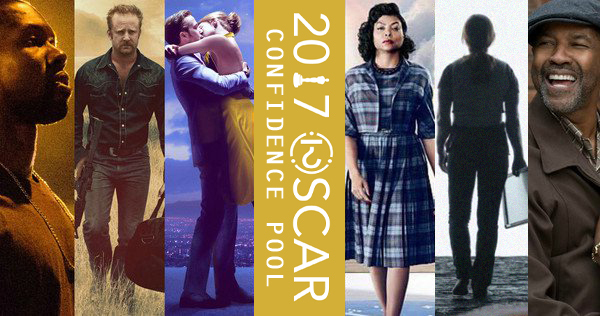 Yes, this was our FIFTH ANNUAL Oscar Pool, and the fourth Oscar Confidence Pool! Saad K. was our first Oscar Pool victor in 2012/2013 with 17 correct picks! Matthew S. won the first Oscar Confidence Pool in 2013/2014 with a still unmatched 22 correct picks for 290 points! In 2014/2015 it was Oliver D. who won our third Pool with 20 correct picks for 270 points! Last year's Oscar Confidence Pool winner was long time Trivia Club competitor Mark P. who won in 2015/2016 with 18 correct picks for 257 points! An added wrinkle for this, the Fifth Annual Oscar Pool is the involvement of teams! As well as an individual award, we will be celebrating the TEAM with the most points! Trivia Club is, after all a group effort, so it seemed only fitting! Teams scores were decided, by taking in all ballots from a team of two or more participants, and averaging the scores! Mark, our first TWO-TIME Oscar Confidence Pool winner!